Amber Pharmacy, a specialty pharmacy headquartered in Omaha, Nebraska, was one of the first specialty pharmacies in the nation. 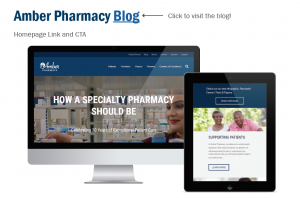 To demonstrate the company’s expertise in providing hands-on care to patients with complex, chronic health conditions, Amber Pharmacy launched a blog on its website in May of 2017. By working with internal clinical experts, Amber Pharmacy’s in-house marketing team continues to publish educational content on its blog weekly, demonstrating its expertise in the industry and commitment to patient care.